Tea is an evergreen shrub that can grow up to 2 meters. Green tea is made when the green leaves of the plant are picked and dried quickly. Northern part of Iran is home to one of the finest types of green tea. Green tea has several health benefits, helps battle cancer and reduce your risk of heart attack, and it is a powerful tonic. It can dissolve body fat, strengthen the nerves, and break fevers. Green tea is a detoxifying agent that can strengthen the stomach and help prevent flatulence. Green tea can improve the memory and bring joy and happiness to the depressed. Also, this herbal tea can decrease Cholesterol and Triglyceride of the blood, reduce the risk of heart attack, and prevent dental plaque and tooth decay. 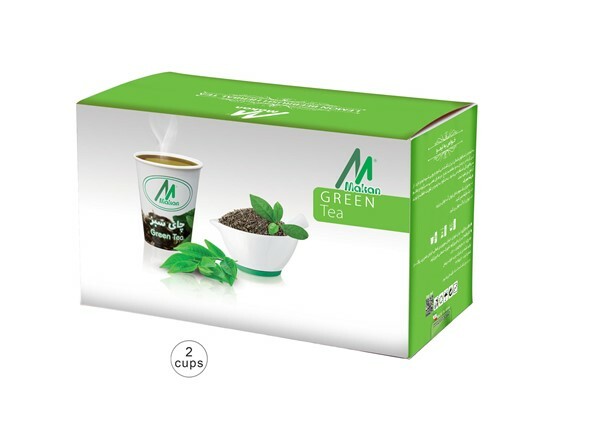 A new genius idea is to fix green tea pods in the bottom of paper cups, making it possible to prepare a delicious and healthy herbal tea in just a minute. These environment-friendly flavored tea cups are recyclable, and can save up time and energy. They come in 1, 2, 4, 12, and 20 cup packs and also without packaging.